Palladium, a Malta-based blockchain company, is today launching the world’s first fully regulated Initial Convertible Coin Offering (ICCO) to give investors peace of mind and a stake in the future of virtual currencies. The issuance of a tokenised convertible warrant — which is regulated by a prospectus approved by the Malta Financial Services Authority (MFSA) and subject to stringent EU rules — will give investors the right to convert the tokens into shares of Palladium three years after the issue date. 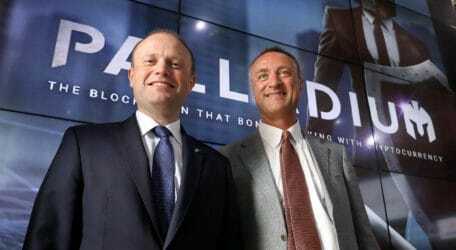 Malta, which is fast becoming the blockchain island, was the natural choice for Palladium’s headquarters and today’s launch was attended by Prime Minister Joseph Muscat, Financial Services Parliamentary Secretary Silvio Schembri, and MFSA CEO Joseph Cuschieri. The fundraising target is €150 million and the pre-sale of Palladium tokens starts today. The offering period for subscription of the tokenized securities will run from July 25 to September 30. Proceeds will be used to support the three core blocks of Palladium’s solution: 50 per cent will go towards the acquisition of a controlling interest in a European bank; 35 per cent into the formation of a regulated crypto exchange and the development of a clearing and settlement blockchain platform; and 15 per cent into strategic investments in financial services and blockchain companies complementing Palladium’s business. The Palladium crypto exchange will be the result of a partnership between Palladium, Unikrn and Bittrex, the premier US-based digital trading platform and a leader in the global blockchain revolution. Bittrex’s technology is designed to build and power crypto trading platforms that provide reliability, scalability and security. Currently, Bittrex lists almost 200 digital tokens and works with token teams around the globe to incubate some of the world’s most innovative blockchain projects. Palladium is also drawing on leading personalities in business, technology, financial services and blockchain to sit on its Board and Advisory Board. Among them are the former CEO of Microsoft Ventures, the former attorney at the US Securities Exchange Commission, and the former managing director of Credit Suisse.